Vacation RV Rental - RV Rentals Dallas - Southwest RV Rentals - Luxury RV Rentals in Dallas - Ft. Worth with Unlimited Mileage! 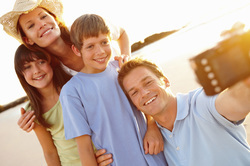 Family Vacations in one of our Large and Comfortable RV's may be just what you need! No mater the season, a Luxury RV makes for a perfect Road Trip Getaway. Are considering traveling for your next vacation? Taking a trip to the Grand Canyon, Yellowstone National Park, or Disney World? Talk to us about taking your family in one of our Exclusive 40+ Luxurious RV's. Our RV's are a vacation all in their own. Along with having Unlimited Mileage, the Special Features and Amenities are endless. You can chose between Campers with Spacious Living Areas, Sleeping for 10, stocked with TV's and DVD players, Fridges and Ample sized Awnings for evenings outside. Our Top-of-the-Line RV's are full of surprises as well! Your choices range from up to 43 feet of Comfort, Leather Interiors, Indoor and Outdoor TV's with Surround Sound, Sleep Number Beds, Washer & Dryers, In-Motion Satellites, and so much more! Headed to a couple different locations? There's no need to rent a costly hotel room where you may second guess the cleanliness. Our affordable RV's are maintained and thoroughly cleaned on a regular schedule, with our guarantee that your rented RV will be as if it were brand new. Cleanliness is a big factor to consider when you are renting anything. At Southwest RV Rental, we take pride in the fact that our fleet is Deep Cleaned and Sanitized after every single usage. Maintenance can also be worrisome, but not with us. We keep our fleet in tip-top shape, being fully maintained at all times. You will never drive out of our lot in an RV with balding tires or due for an oil change. Your safety and your passengers safety are our number one priority! If you would like more information regarding Southwest RV Rental's RV and Campers for Vacations, call us today at (972) 221-2023.